For the reaction of 1,3-butadiene with DBr (D = heavy hydrogen), I found that several possible products could be formed. A pair of enantiomers is formed. One of the pi bonds attacks the heavy proton and the leaving group, bromide anion, comes back around to take care of the allylic carbocation. Because the bromide can attack from both above and below the plane of the carbocation, both enantiomers are formed. 2) Now, because there is resonance, the carbocation possesses partial primary allylic carbocation character. As a result, bromide anion may also attack at a different position. This results in an internal alkene - the more stable alkene (the Zaitsev alkene). Diastereomers are formed as well because single bonds can rotate, and the partial, terminal double bond can be "flipped" upward in the resonance depiction (I know that resonance depictions do not exist independently; hence "partial"). 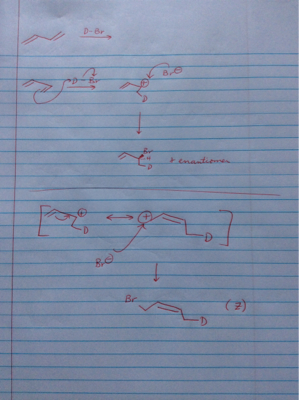 This allows the Z alkene to be formed in addition to the E alkene, as illustrated by my mechanism. 1) Are the products all valid and correctly categorized? 2) Is the E and Z isomer each produced, and in the way I think both are produced? You have only considered reaction from the s-trans conformation of 1,3-butadiene, where the 2 double bonds are in a cis relationship about the central single bond. The s-trans conformation is in equilibrium with the s-cis conformation. The s-cis conformation can react also react to the terminal olefin, but also (by the mechanism you described) it can react to produce the z 2-butene as one of its kinetic products. Hence, all 3 butenes (1-butene and e and x 2-butene) can be formed as the kinetic products. Not the answer you're looking for? Browse other questions tagged organic-chemistry reaction-mechanism stereochemistry reaction-control or ask your own question.